All American Window Tinting, Inc. (AAWT) in Denver is the best Commercial window Film, Residential Window Film, Automotive Window Tinting and Clear Bra Paint Protection Film company in Denver Colorado! Family owned and operated. We have been at the same location, 2155 West Evans Avenue, Denver 80223, cooling Colorado and providing car window tint, home window tint, and commercial window tinting services in Denver and all of Colorado since 1993. Our team of professional window tinters and Clear bra paint protection installers have over 20 years of experience and are proud to have serviced over 100,000 clients! Specializing in large, oversized, vaulted, irregular-shaped and numerous windows. All American Window Tinting, Inc. (AAWT) in Denver has the best residential window tinting, commercial window tinting and car window tinting professionals in Colorado. Once you have a window film project completed by us, you will see the high-quality standards we have in our car tint, home tint and office tint installations. AAWT offers a wide variety of different window tint and window film options to meet each individual need. Privacy window film, Shatter-Resistant window film, Anti-Graffiti window film, UV protecting window films, Fade protection window films, Energy Saving tint, Decorative and Mirrored window tint, Frosted and Colored window film….you need it, we have it! We understand Window Tint for your car, home or office is not one size fits all! When choosing a window film or window tint you must first understand how window tint film works. The heat we feel from the sun comes from three sources. 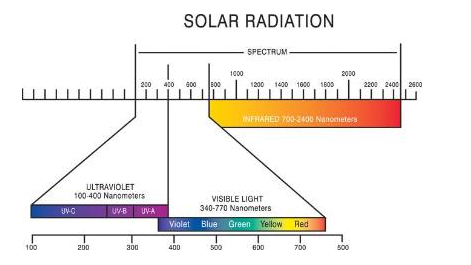 53% is Infrared Rays (IR), 44% is Visible Light Transmission (VLT) and 3% is Ultra Violet Rays (UV). Most window films block 99% of UV rays because most window films’ UV inhibitors are in the adhesive of the film. In the past, to block a lot of heat you had to have a very dark window film, however, technology has advanced quite a bit over the years. This advanced technology allows for a lighter window film with the high heat rejection qualities of a dark window film. The way heat is blocked and how much is blocked depends on the film and the type of glass you have installed in your home or office. Contact us today to set up your free in-home or office consultation and let our experts help you choose a window film that will meet your needs and your budget for window tinting in Denver! According to the International Window Film Association (IWFA), when solar energy enters the earth, it is divided into three wavelengths. The ultraviolet band which measures from 100-400 nanometers is the part of the spectrum that is most responsible for fading out of carpets, drapes, fabrics and paint. 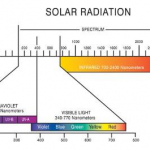 The UV band makes up 3% of the solar spectrum. The visible band runs from 380-780 nanometers and is the only part of the solar spectrum actually seen with our eyes. 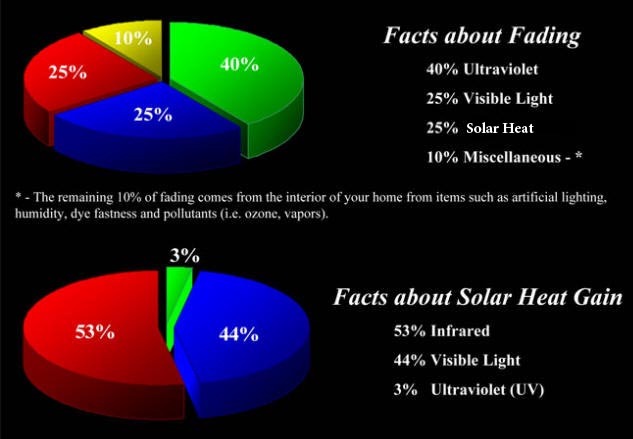 Visible light is 44% of solar energy. The Infrared region is the heat band. We are aware of the heat but unable to see it. The infrared band is made up of 53% solar energy. We carry only the best, top quality window tints, window films and Clear bra products in Colorado. Our product selection includes High-Performance window films such as Huper Optik Select Series and Nano-Ceramic, Llumar ATC Color Stable and CTX Ceramic window tint and 10 year backed LLumar self-healing Paint Protection film. Whether its heat reduction, glare control, UV and fade protection, privacy, anti graffiti film, decorative or security, Or paint protection for your vehicle, we can help you find the best window film to suit your needs. Our installers are at the top of their field when it comes to the art of window tinting in and clear bra installation in Colorado. We have the experience and the knowledge to achieve the goal for each project we complete. AAWT is the only Company in Colorado to hold a Master Accreditation through the International Window Film Association. We continue to educate our team on the newest trends in window film technology. Please call today to schedule a free in-home consultation estimate for your home or office. Or call us for a phone quote for clear bra or paint protection film installation and car or truck window tinting; you will be glad that you did. Start taking precautions and protect your paint, furnishings, wood work, art from fading, and loved ones against the harmful ultraviolet damage that the sun can cause. If you are tired of feeling the sun burn you in your car, truck, SUV or in your home or office, please call All American Window Tinting, Inc. today to help you beat the heat. We definitely have the answers to all of your solar predicaments. All American Window Tinting, Inc. (AAWT), simply the best when it comes to window film and clear bra paint protection film applications in Denver, Lakewood, Aurora, Westminster, Arvada, Thornton, Boulder, Broomfield, Centennial, Englewood, Highlands Ranch, Littleton, Castle Rock, Castle Pines, Parker, Colorado!